REVO's discrete indoor dome with tinted dome housing. This super high resolution camera gets crisp, clear images with 700 TV Lines. Dome camera is designed for indoor use and includes a wall bracket. No visible cables once mounted. Built in Infra Red (IR) LEDs allow turret camera to see up to 100' in total darkness. It has a built in microphone for audio capabilities and a 3.6mm lens for a wide angle view. 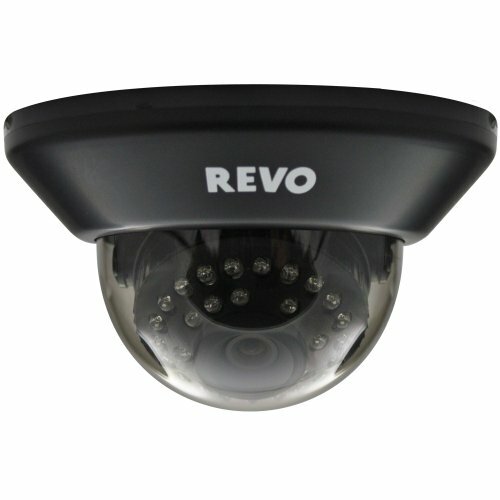 Camera utilizes REVO's RJ12 Quick Connect Cable for easy installation. One cable carries power/audio/video. 60FT of cable included, extensions sold separately. If you have any questions about this product by REVO America, contact us by completing and submitting the form below. If you are looking for a specif part number, please include it with your message.